Announcing the Communist Party Convention, June 2014! Home > Article > Announcing the Communist Party Convention, June 2014! The people of the United States face enormous challenges today. We live in a capitalist system where the 99% of people struggle every day to survive and the richest 1% control the vast majority of wealth and power. Capitalism cannot meet the needs of the vast majority. Economic inequality and job insecurity are increasing. Working families are living with less and working longer hours. The infrastructure of our cities and towns is deteriorating. Our schools are underfunded and essential public services are strapped and slashed. Home foreclosures are everywhere and millions of people are homeless and hungry in the richest country in the world. Racism, sexism, homophobia and all kinds of discrimination are commonplace. Working men and women fight and die in wars around the globe for U.S. corporate interests. We also face an urgent threat to the very survival of life on the planet. Climate change is the byproduct of capitalism. It is working people, the poor and communities of color who face the most direct consequences of global warming and the poisoning of our environment. The drive of the rich and powerful to gain wealth at the expense of working people is the only logic of capitalism. But everywhere in our country people unite to fight to improve their lives, to change the world for the better. The main obstacle to progress today is right-wing extremism. Right wing spokespeople and groups represent and are funded by the most conservative sections of the rich and powerful. The extreme right, which now dominates the Republican Party, is seeking to roll back all the social and economic rights that working people fought for and won. They want to take the country back to a time before marriage equality, before voting rights, before women’s reproductive rights, before the right to a union. It seems at times that they want to take us back to the days of slavery. Democracy itself is under attack from this far-right group and their servants in the Washington and statehouses around the country. It’s increasingly clear to millions of people: another world is possible and necessary. Another U.S. is possible too. Capitalism cannot solve these problems, we need a socialist USA. Socialism is a system where working people together decide how society is run. Where people and the planet are put before corporate profits. Where democracy is expanded to include economic justice and equity. Socialism is again becoming recognized among the people of the U.S. as the only real alternative to capitalism. The Communist Party of the United States of America has a 95 year history of fighting for democracy, jobs, equality and socialism. Our party reflects the diverse working class of our country. Our members are of all the races, ethnicities and nationalities that make up the rich fabric of U.S. society. We are native born and immigrant. We are men and women. We are young and old. We are straight and gay. We are atheists, people of faith and agnostics. We are from every region and state, every walk of life and profession. Our party has a unique history of struggle against racism, for workers’ rights, against war, for equality and justice. We organize in big cities and small towns, in every kind of workplace and neighborhood, on campuses and in community centers, in town halls and the halls of Congress. We have always joined together with others because unity is the key to victory. We join the fight against the right wing today and build for socialist tomorrow. We are proud to announce our 30th National Convention, June 13-15, 2014 in Chicago, the city of our birth. Leading up to our convention, we will discuss the challenges and opportunities that working people face today. We will share experiences and discuss how our party can more effectively help build a people’s movement capable of transforming the country and making the future brighter for everyone. And we want to share this discussion with our friends and allies, with all those fighting for a just society. Join us! In unity there is strength. The people united will never be defeated. 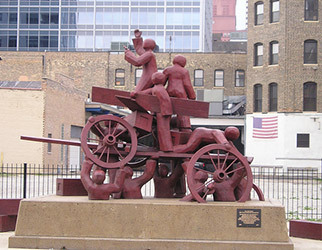 The Communist Party USA is a working class organization founded in 1919 in Chicago, IL. The Communist Party stands for the interests of the American working class and the American people. It stands for our interests in both the present and the future. Solidarity with workers of other countries is also part of our work. We work in coalition with the labor movement, the peace movement, the student movement, organizations fighting for equality and social justice, the environmental movement, immigrants rights groups and the health care for all campaign. But to win a better life for working families, we believe that we must go further. We believe that the American people can replace capitalism with a system that puts people before profit — socialism. We are rooted in our country's revolutionary history and its struggles for democracy. We call for "Bill of Rights" socialism, guaranteeing full individual freedoms. Introducing CPUSA’s new youth-run podcast: The Specter!